An Al-Qaeda branch has claimed responsibility for an attack that killed 16 people at the Grand-Bassam beach resort on Cote d’Ivoire, which is known for being popular with Westerners. Reports claim that four of the victims are Europeans. Two gunmen opened fire on a beach, injuring several people, a local tourist guide told France24. According to Reuters, there were four gunmen involved in the attack. Al-Qaeda in the Islamic Maghreb has claimed responsibility for the assault, according to the SITE Intelligence Group. 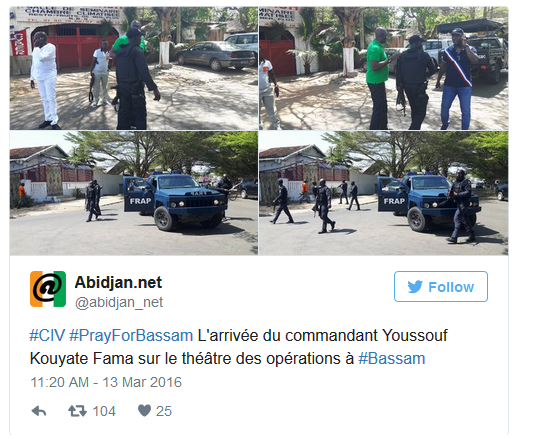 Six assailants have been neutralized in the police operation so far, Cote d’Ivoire’s Interior Ministry said. 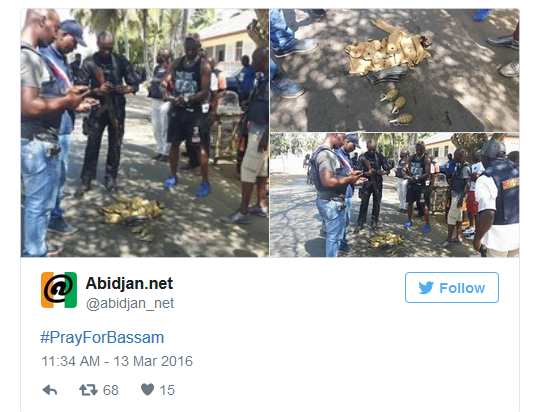 “Three hotels in Grand Bassam were attacked this Sunday by armed men. Security and defense forces intervened immediately and were able to neutralize six terrorists. The clean-up operation is under way,” Interior Minister Hamed Bakayoko said on state television. The assailants, who were « heavily armed and wearing balaclavas, fired at guests at the L’Etoile du Sud (Southern Star), a large hotel which was full of expats in the current heatwave, » a witness told AFP. A combined total of sixteen people, including fourteen civilians and two soldiers, were killed in the attack, Cote d’Ivoire President Alassane Ouattara said. “Six attackers came onto the beach in Bassam this afternoon … We have 14 civilians and two special forces soldiers who were unfortunately killed,” said Ouattara, who visited the site where the assault took place. A police source told Reuters earlier that there were “four Europeans” among the victims. Earlier, another witness told Reuters that he saw at least seven corpses. “I saw seven dead that I filmed. There were four attackers. I was swimming when it started and I ran away,” said the witness, who managed to shoot a video at the site. One person killed in the shooting was a French citizen, according to France’s Foreign Ministry. “France will bring its logistical support and intelligence to Ivory Coast to find the attackers. It will pursue and intensify its cooperation with its partners in the fight against terrorism,” French President Francois Hollande said. A video reportedly shot at the scene and posted on Facebook shows people fleeing from the beach through the territory of one of the hotels. Graphic images of people covered in blood and lying on a beach have been posted on social media. The total number of casualties is still unclear. The attackers were reportedly armed with machine guns and had a significant number of grenades, according to photos witnesses posted on Twitter. Grand-Bassam is located in the south-east of Cote d’Ivoire, lying 40km from the main city of Abidjan. In 2012 it was added to the UNESCO World Heritage Site list. The resort is popular with Westerners, according to AFP.